When we set out to refresh the existing FAS3100 line, we knew we needed to do more than just give it the standard bump in performance and capacity while holding the line on cost. Substantial market changes called for us to rethink midrange requirements. First, we knew that each FAS3100 system in our installed base already had an average of 3.3 expansion slots populated (of a possible 4), so expandability was clearly becoming a limiting factor. And, with the transition from FC to SAS disk taking place in the storage industry, we knew we needed to help facilitate that transition by providing on-board SAS and FC ports and by making sure that storage systems could simultaneously support significant numbers of both types of ports when needed. When we started to design the FAS3200 series, we began by looking at the lower end of the then-current midrange and asking how we could best fill that price/performance niche. That led us immediately to focus on a 3U design in place of the 6U design of the FAS3100 series. The 3U chassis of the FAS3200 series can be occupied by dual controllers (HA pair) or a single controller plus an I/O expansion module with four additional PCIe slots. By combining two 3U chassis—each with one controller and one IOXM—we also created an HA pair that occupies 6U like the FAS/V3100 series, but offers much more expansion capability: six slots in each chassis. With the FAS/V3200 series you now have the option to choose from standalone and HA models with limited expansion potential (two PCIe slots per controller) and maximum space efficiency or significant expansion capability (six PCIe slots per controller/IOXM pair). That’s 50% more PCIe slots than the FAS/V3100 series offers. In general, NetApp recommends using the two slots built into the controller for high performance 10GbE and/or 8Gb FC adapters. 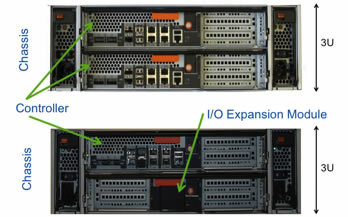 The additional expansion slots in the IOXM can be used for NetApp® Flash Cache and additional connectivity for FC or SAS disks. The availability of these four slots offers obvious benefits for configuring systems to take advantage of NetApp Flash Cache to accelerate I/O and reduce disk requirements and to configure systems that simultaneously contain enough FC and SAS ports to facilitate making the transition from FC disk to SAS disk. The transition from FC to SAS disk is the subject of another article in this issue of Tech OnTap. FAS/V3200 vital statistics (dual-controller HA configurations). The on-board SAS ports offered on the FAS/V3200 series also are intended to facilitate those needing to make the transition from existing FC disks. Where we previously had four 4Gb FC ports on each midrange controller we now have two 4Gb FC ports and two SAS wide ports. Each port provides four SAS links, each running at 6Gb/sec (SAS 2.0), for an aggregate bandwidth of 24Gb/sec per port. The FAS/V3200 now includes two on-board 10-Gigabit Ethernet (10GbE) ports for HA configurations. The FAS/V3100 series used InfiniBand as the HA interconnect. For the FAS/V3200 series we’ve moved from InfiniBand to 10GbE in keeping with the general trend toward network convergence on Ethernet. The on-board 10GbE ports are reserved for use by the HA interconnect and cannot be used for any other purpose. In single-chassis HA configurations, the interconnect signaling is done over the backplane, so no external cabling is needed; these ports are only used in the dual-chassis HA configurations of the FAS3240AE and FAS3270AE. The FAS/V3210 and FAS/V3270 use Intel® Wolfdale processors while the FAS/V3240 uses Intel Harpertown. NetApp Engineering worked directly with Intel to modify the Intel chipset to allow NetApp NVRAM to be part of main memory. As you probably already know, all NetApp systems use nonvolatile memory to log incoming write requests as a means of accelerating write response times. This has typically been provided as a separate card or a dedicated portion of the motherboard. Providing NVRAM from main memory is faster and also decreases cost. NetApp Engineering worked with Intel to create a self-refresh sleep mode in the Intel chipset called Asynchronous DRAM Refresh (ADR) that allows a portion of main memory to be backed by an on-board battery. This gives the NVRAM the same high bandwidth as main memory and simplifies the motherboard design. The performance gains we’ve seen with the FAS/V3200 line are due in part to this change as well as to the great performance we’ve seen from the Intel processors. For instance, on the SPECsfs benchmark (SPECsfs2008_nfs.v3), the standard benchmark for measuring NFS performance, the FAS3270 delivers 101,183 ops at 1.66ms ORT while the previous FAS3160 midrange submission was 60,507 ops at 1.58ms ORT, providing almost a 70% increase in SFS throughput. For out-of-band management of NetApp SAS disk shelves, NetApp has created its Alternate Control Path (ACP) technology. ACP enhances data availability by giving a storage controller the ability to reset a storage channel without having to communicate over that channel. If a channel is down or misbehaving, a quick reset can bring it back online without external intervention. ACP allows a storage system to recover from faults that might otherwise require it to reboot, and that’s a big advantage. ACP gives you a back door into your disk shelves. It is completely separate from the SAS data path and provides new options for nondisruptive recovery of shelf modules, including the ability to reset or power-cycle an individual I/O module or an entire domain. We designed in the ability to power-cycle an entire shelf as well. ACP technology enhances the ability of Data ONTAP to automatically reset a misbehaving component in order to return it to a fully operational mode without disruption. NetApp has innovated over a period of many years to create new software features that add to the core capabilities of Data ONTAP and NetApp storage. In keeping with the NetApp philosophy, we’ve brought much of that functionality and value to you at no additional cost. However, a review of our software showed that we had 30+ options for you to choose from. We think you’ll agree that the situation was overdue for some simplification. NetApp began by grouping the most common options—including many options that were previously only available for a separate charge—into Data ONTAP Essentials. This is provided for the FAS3200 series at no extra charge. One storage protocol of your choice (iSCSI, FC, CIFS, NFS) is also included with Data ONTAP Essentials. SnapManager® Suite includes the SnapManager and SnapDrive® products for all supported software. To make things easier still, you can also choose the Complete Bundle, which gives you all protocols and the five software modules shown above. 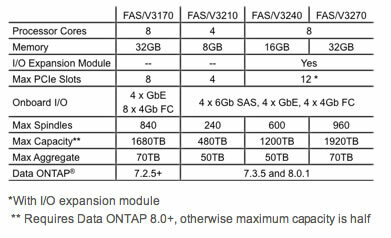 The FAS/V3200 series is currently supported on Data ONTAP 7.3.5 and Data ONTAP 8.0.1. The FAS/V3200 series continues the steady pace of innovation and incremental improvement that started with the original FAS/V3000 series. NetApp has grown its midrange offerings in interface speeds, port counts, processor, and, ultimately, system performance and resilience. Today’s FAS/V3200 series offers on-board SAS ports and 50% more expansion slots to make it easier to find room for important expansion cards such as Flash Cache, network ports, or a mix of FC and SAS adapters. Fifteen percent more spindles provide both more performance and more capacity. The end result is higher performance and lower-cost storage that is easy to deploy and use. Ask questions, exchange ideas, and share your thoughts online in NetApp Communities. Steven has been the platform architect for NetApp for almost six years and was responsible for the FAS3100, FAS3200, and FAS6200 series as well as the Performance Acceleration Module (PAM) and Flash Cache (PAM II). He is also the NetApp Engineering liaison to the National Security Agency (NSA), National Geospatial-intelligence Agency (NGA), and the Central Intelligence Agency (CIA). Steven is currently involved with several IEEE and industry groups. He is credited with 22 issued patents and 19 pending applications in the areas of storage and high-performance computing.